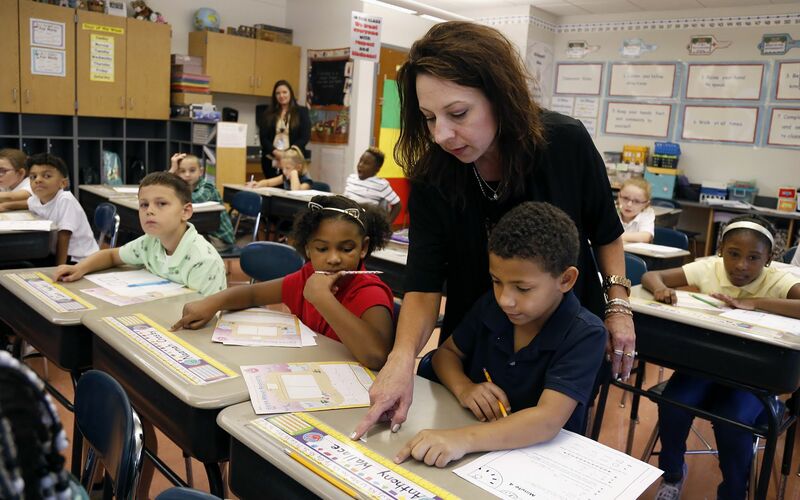 Yvonne Tutera, a second-grade teacher at Francis McClure Elementary in the the McKeesport Area School District, teaches math class on Aug. 29. It was a chilly Saturday morning when a handful of teachers lined up outside of The Education Partnership warehouse in the West End, waiting for the opportunity to fill shopping carts with free school supplies. Yvonne Tutera, a second-grade teacher from the McKeesport Area School District, stood at the front of the group, along with her husband and a big bag to carry home her take. They drove an hour to make the partnership’s last distribution for the 2017-18 school year. It seemed to be the only way her students could each get a new pack of crayons. “In second grade, crayons are a big deal,” said Tutera, who teaches at Francis McClure Elementary. Right behind her was Sherri Koger, a second-grade teacher at Sto-Rox Primary Center, who shared Tutera’s sentiment about how precious the new crayons would be to her students. “Unless you are living in poverty, you don’t understand it,” Koger said. The teachers also scooped up laptop bags that could be used by students without book bags and clothing for students who may be in need. 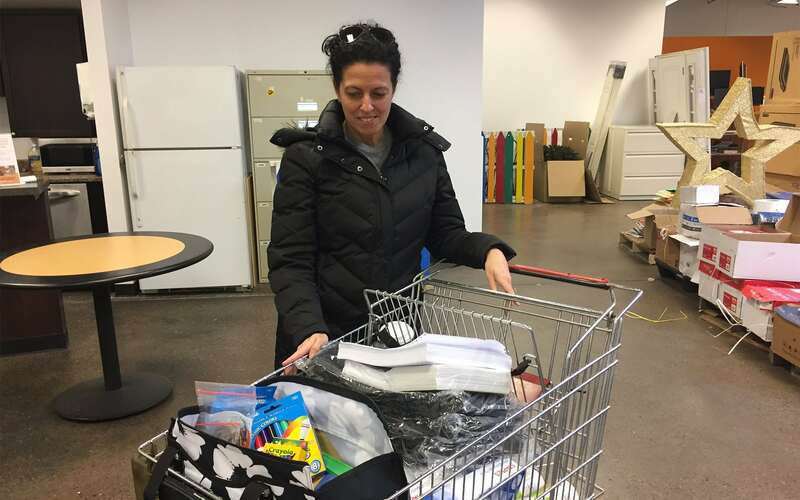 Sherri Koger, a second-grade teacher at Sto-Rox Primary Center, leaves The Education Partnership distribution on March 10 with a cart full of supplies for her students. For some teachers, the partnership’s giveaways are the only way many of their students get school supplies and access to classroom necessities like hand sanitizer, tissues and disinfectant wipes — the kinds of things parents often supply in wealthier school districts. In communities where neither district nor family budgets allow for the purchase of school supplies, some teachers go to great lengths to fill the gaps. 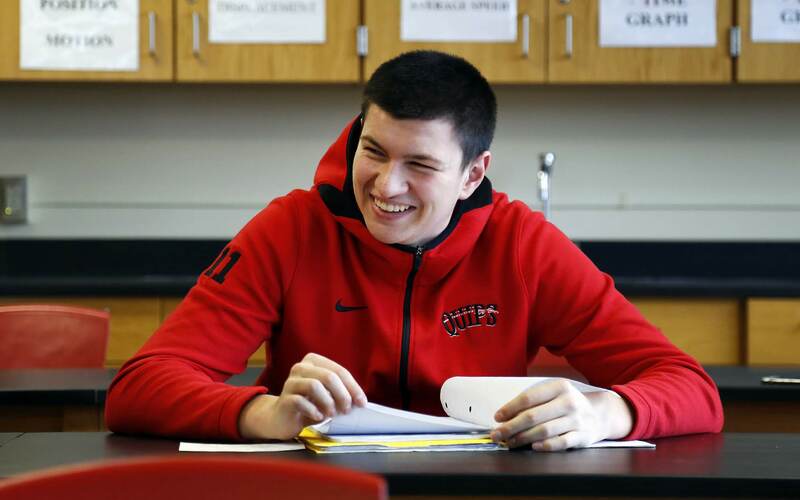 Teachers in a number of financially struggling districts in Southwestern Pennsylvania rely on The Education Partnership. 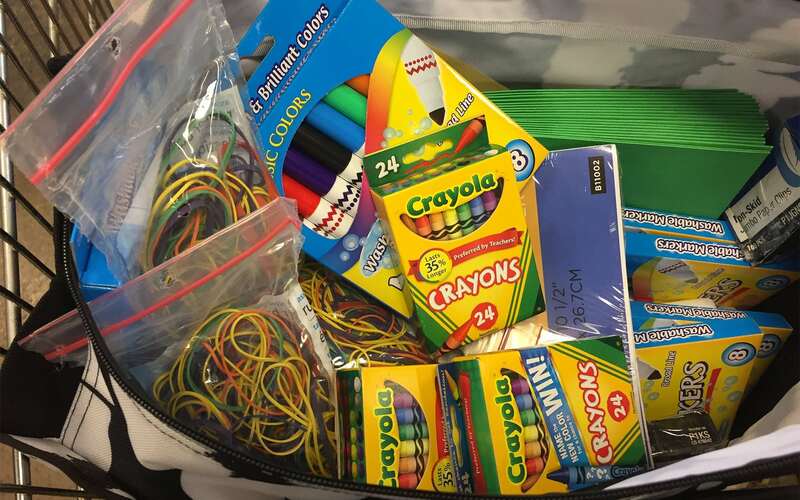 Since its inception in 2011, the local nonprofit has distributed about $17.4 million in school supplies. The partnership was started by Justin Brown, who previously served as the director of the Pittsburgh Community Storehouse, an organization that donated gifts to “economically disadvantaged communities and individuals.” Brown believed the program could have more impact with a narrower focus and as a result changed the name and its mission to focus on disadvantaged schools and students. Another way teachers get materials and equipment for their classrooms is by posting requests on DonorsChoose.org, a website designed for educators to seek support year-round. Some of the requests are for electronics such as iPads and Chromebooks. But others are as basic as seeking money to purchase fans for a stifling classroom — a request by Sto-Rox Junior-Senior High School Spanish teacher Ben Engelhard. Most of the school has no air conditioning, and Engelhard said temperatures can rise as high as 90 degrees. Even with their efforts online and support of the partnership, teachers still spend money out of their own pockets to make sure students don’t go without. A study released by the U.S. Department of Education in May showed that 94 percent of teachers in traditional public schools spend their own money on classroom supplies, with the average expenditure at $479. Tutera said she spends between $100 to $200 a year on her classroom. The Education Partnership giveaways help her keep costs down. Jennifer Schlata, a first-grade teacher in the Clairton City School District, estimated she spent $2,000 on her classroom in 2017. The money is spent on positive behavior rewards: lip balm, Band-Aids, classroom decorations and seasonal activities like the chips-and-salsa classroom party on Cinco de Mayo. Yvonne Tutera, a second-grade teacher at Francis McClure Elementary in the the McKeesport Area School District, goes over a math lesson with student Anthony Wallace on Aug. 29. 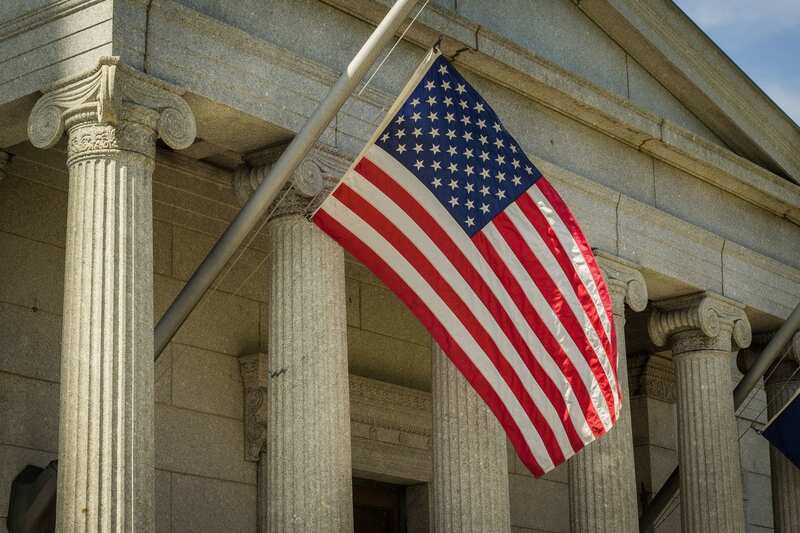 Schlata referred to the neighboring and better-resourced West Jefferson Hills School District, where she worked as a long-term substitute at the former Jefferson Elementary for part of the 2011-12 school year. At Clairton, she has used DonorsChoose.org to get a document camera, flexible seating in her classroom, two Amazon Fire tablets and 20 sets of headphones. Most of the donations came from friends and family. “God love them,” Schlata said. To be sure, teachers at West Jefferson Hills School District and other wealthier districts will sometimes fundraise or spend their own money on discretionary improvements to their classrooms. In Sto-Rox, band teacher Suellen Engelhard has multiple fundraising efforts going on at any given time. Band is an expensive subject to teach. Students need instruments that are in good condition, drum sticks and reeds and lunches during band camp. In other districts, those items are supplied by the district and parents. The latest mission centered on the 30-year-old Sto-Rox band uniforms. For months, Engelhard has been involved in fundraising efforts in the community to buy new band uniforms, at a cost of $30,000. The students will receive the new uniforms in October. And recently, Engelhard and the students got another boost of support when the Montour School District band parents funded some of her requests after reading a PublicSource story about the lack of resources at Sto-Rox as compared with their district. The Montour district is located 3 miles away. In March, Engelhard and other Sto-Rox teachers got a pleasant surprise when a single donor funded all $29 million worth of projects listed on DonorsChoose.org. 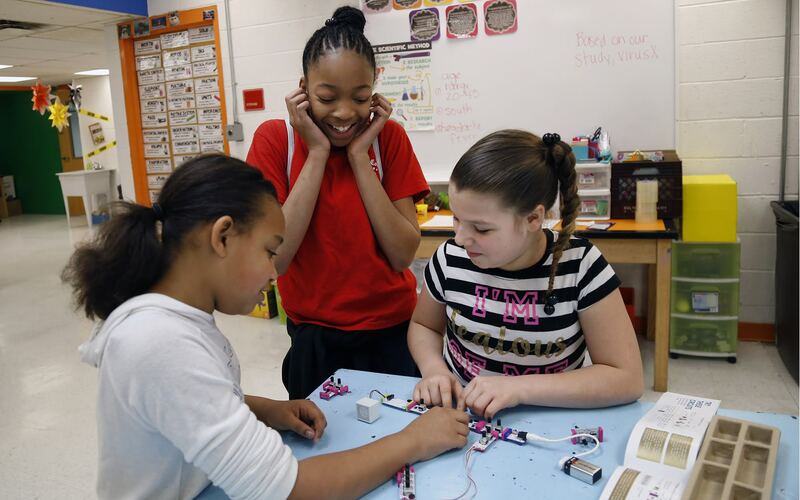 At the time, 14 Sto-Rox teachers had projects that were funded for a total of $13,800. 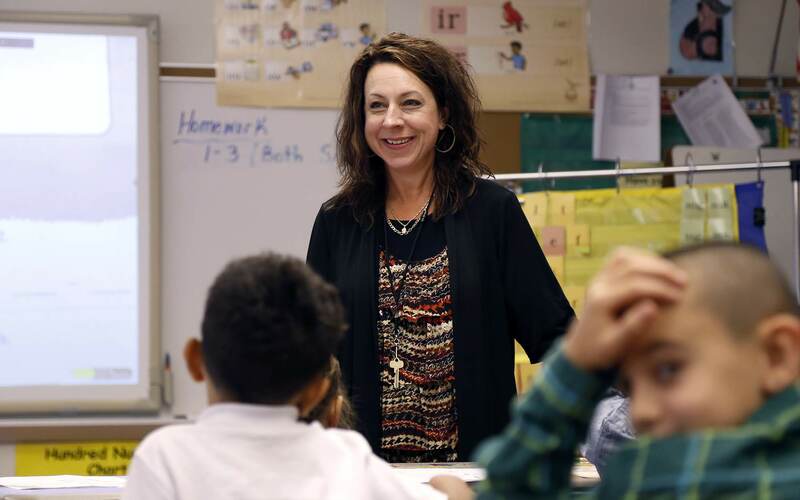 “In second grade, crayons are a big deal,” said Yvonne Tutera, a second-grade teacher at Francis McClure Elementary in the the McKeesport Area School District. Ashley Dickinson, a fourth-grade teacher at Sto-Rox Upper Elementary, has used the DonorsChoose site to make her classroom more inviting and comfortable for students. A vibrant rug with a map of the United States adorns the front of the room. And, instead of desks, the classroom features round tables with colorful chairs. Dickinson said she is more successful than some of her colleagues at raising money online because she posts her projects on her Facebook page and other social media. In the 2017-18 school year, she raised about $10,000 for her classroom, including money for 15 Chromebooks. But that was an extraordinary year. Usually she raises $2,000 to $3,000. “I feel like I spend most of my time here and my kids do, too. I want to make it as pleasant as possible,” she said. In the Duquesne City School District, preschool teacher Kayla Pollacci said she spent about $5,000 in her first year teaching the class. The money was spent to equip her classroom with everything she felt a preschool classroom should have — including toys, age-appropriate craft supplies, markers, puzzles, blocks and classroom decorations. 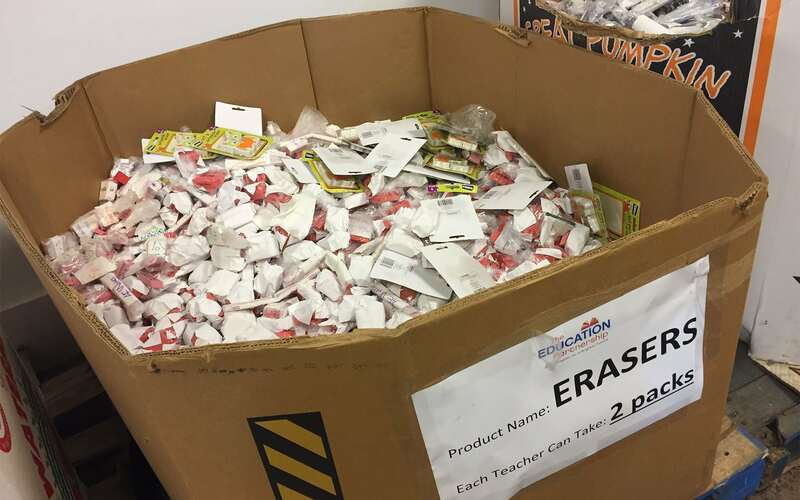 A bin full of erasers is set out at The Education Partnership distribution on March 10. After spending so much money her first year, she discovered the DonorsChoose platform and has used that for about $7,500 worth of projects in the four years she’s been teaching. Among the items she’s funded through the site are whiteboards, a LEGO table, student mailboxes and a carpet. “Now I spend about $500 over the summer on stuff I want, like decorations and stuff,” she said. Pollacci explained why she and other teachers in struggling districts dip into their own pockets for their students.